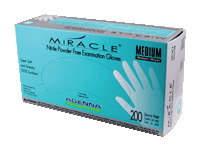 Adenna's MIRACLE® glove is a thin gauge, light weight, powder free nitrile exam glove. It is soft and very flexible, providing an excellent fit and superb tactile sensitivity. It is 100% latex free eliminating potential risk of rubber latex sensitivities. Because of its thin gauge, the gloves are packed 200 pieces by weight in a standard size dispensing box to save you shelf space, packaging material, money and time as you don't need to replace empty dispensing boxes as frequently. - "Skin-like" fit and feel provides superb tactile-sensitivity along with a lightweight, ideal modulus.